PracticeLink.com S PRIN g 2018 7 EMPLOYER INFORMATION 9 Company Index Where to find the organizations featured in this issue. 11 Specialty Index Search for employers recruiting your specialty. 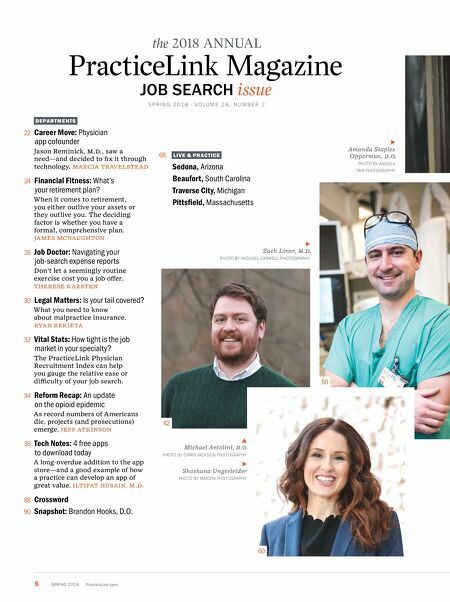 12 Employer Index A directory of employers featured in this issue— organized by location. Index includes the page number, contact information, website and codes for the specialties being actively recruited. 45 See this issue's physicians in exclusive video interviews at Facebook.com/ PracticeLink t Parin Patel, M.D. 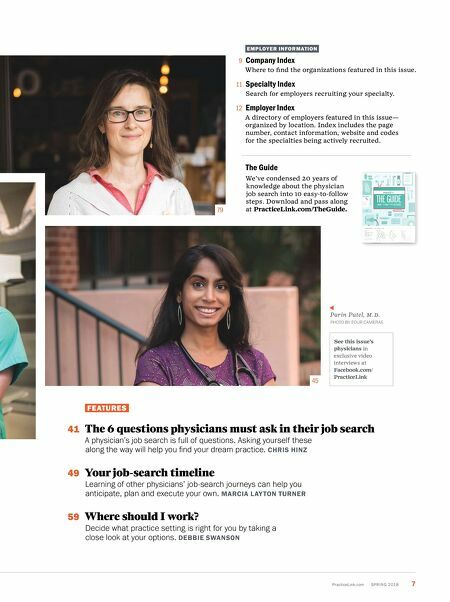 p HOTO BY FOU r CAME r AS 79 FEATURES 41 The 6 questions physicians must ask in their job search A physician's job search is full of questions. Asking yourself these along the way will help you find your dream practice. CHRIS HINZ 49 Your job-search timeline Learning of other physicians' job-search journeys can help you anticipate, plan and execute your own. MARCIA L AY TON TURNER 59 Where should I work? Decide what practice setting is right for you by taking a close look at your options. DEBBIE SWANSON The Guide We've condensed 20 years of knowledge about the physician job search into 10 easy-to-follow steps. Download and pass along at PracticeLink.com/TheGuide.